Examples of the AM 490 could be seen on Derby's Market Place, following the area's re-paving in 1994. 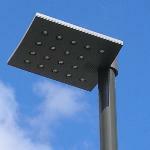 Approximately 15 years later, these installations were removed in favour of Philips Urbanscene modular lanterns. This heritage lantern can be seen around the Darley Abbey area of Derby and on the Slopes in Buxton, to name a couple of places. 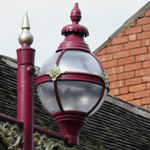 Another heritage lantern - this design can also be found in the Darley Abbey area; as well as the Markeaton Brook footpath in Derby City Centre. I have only come across the P178 in public use in and around Birchwood Close in South Normanton. All examples run 35 W SOX. 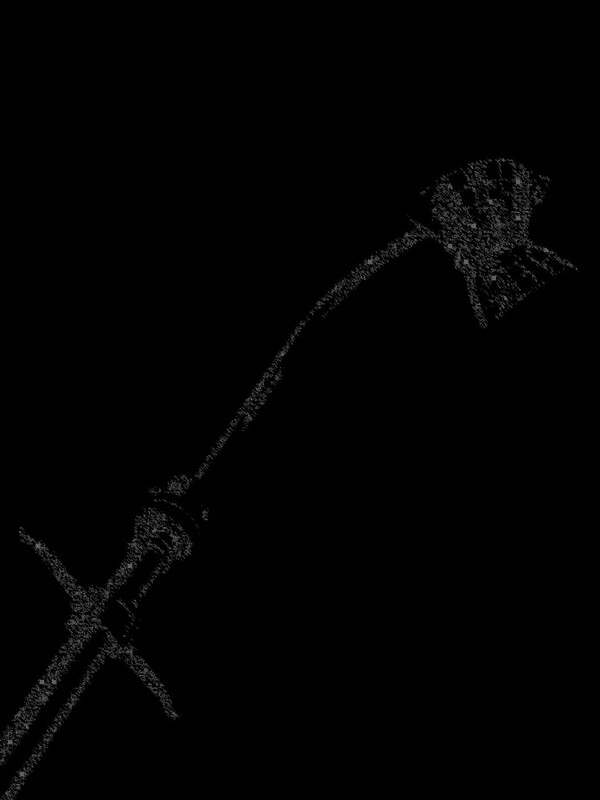 Again, this lantern is not widely used in this area - the only one I know of is at a mini-roundabout near the Raynesway by-pass. 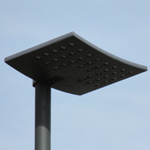 One was installed at the Stenson Rd roundabout on the ring road until the early 2000s but was removed when pedestrian crossings were installed at two of the roads off the roundabout. Although the Concourse is more widely seen in this area on educational property, it started appearing in car parks in 2005 using 100 W 'Metal Arc' lamps. At the time, metal halide was a new option for the Concourse - previously, the only lamp types that could be used was SON and mercury. This modern post-top lantern can be seen outside Derby's St Mary's Church, along with the open space between Derby Cathedral and the Industrial Museum. Examples can also be seen on Derby Railway Station's platforms. Double-bracketed heritage columns supporting Victoria lanterns can be seen in the pedestrianised areas of Long Eaton and Ilkeston Town Centres. 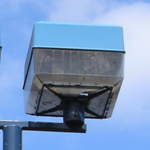 They were installed in the early 1990s and have (as of 2014) started to show their age somewhat. Yet another ornate lantern to be found in the Darley Abbey Area - I suspect that these lanterns might be newer than the Phosco examples. 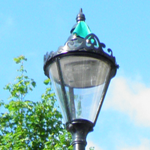 The Windsor is used on Derby's Iron Gate and also in some parks and open spaces around the area where modern-looking lanterns would look out of place. The Iron Gate Windsors were installed in the mid-1990s when the road was closed to through traffic. This lantern was generally used as a footpath lantern on many housing estates built between the late 1970s and early 1980s in the Derby City area; however some were used to light the side roads of these estates as well. Although mercury versions were available, examples around here were always SOX - typically 35 W; though some were fitted with 55 W lamps. In the 1990s and early 2000s, the trend was always to fit a 35 W lamp. This policy seems to have been revised in 2006 as several lanterns have been spotted running 55 W lamps again. I did not realise that there were any Z5699s in this area until Thursday, 27th July 2006 when I went on a history tour of Derby's City Centre. The one I spotted is on the riverside footpath behind housing on Duke Street. I would think that it dates from about the same time as the Z5698Us in the city. This example has now been removed - please have a look at the page for an explanation. The Precinct is quite a rare lantern in this area; with examples really only being in and around Derby's Arboretum Park. Various lamp combinations exist - from 70 W-110 W SON, and 125 W MBF. As with the DW Windsor 'Windsor', the Metcraft Victoria is used in locations where 'period' lighting is more suited. A variety of lamp types are used - perhaps the most unusual being the 55 W QL Induction lamp. I only know of one EP145 in this area - it is located on an Abacus raise-and-lower column in an alleyway to the left of Derby Cathedral and looks to have been a replacement for something else. 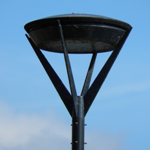 This lantern was never widely used in this area; however, several were installed along East Street on 10 m Thorn Aluminium columns when the Eagle Shopping centre was built in the 1970s. 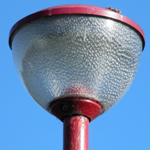 This lantern found a use on many footpaths and car parks owned by Housing Associations - usually running mercury lamps though a small number used 35 W SOX. This lantern took over from the Z5698U - it first started appearing in the mid-1980s in housing estates dating from this time. Many footpaths on older housing estates were lit for the first time around then as well; and so the Gamma 6 was the choice lantern. The lantern was later used to replace failed Z5698Us until the late 1990s. The choice of lamp was usually 35 W SOX; however 70 W SON and even 80 W mercury examples were used in places. With the Gamma 6 being discontinued in 2002, the Basique was brought out as a replacement - though it only started appearing here in 2005 as post-top replacements between these three years usually consisted of the column being made side-entry with the addition of a bracket. The Johanna is confined solely to a small area between Derby's Market Place and Council House. The lanterns use 70 W SON lamps and are controlled by Royce Thompson P9 column-mounted cells. Several Regent lanterns were installed in the historical Derbyshire village of Eyam as part of a nearby new housing development that was constructed in the late 2000s. The Royal is used on St Michael's Lane (nothing to do with me, I promise!) in Derby City Centre. I am not quite sure how old the lanterns and columns are but I am guessing that they probably date from the mid-late 1990s or early 2000s. The only difference between the Regent and the Royal is that the former has ornate latticework applied around the rim of the canopy, whereas this is omitted with the latter. The Skye was used in a couple of city-centre parks up until 2004 when most were (ironically) replaced due to continuing problems with vandalism. Another remained in Little Eaton Park until sometime in mid-2006 when it was replaced with a Philips XGS 103 - the reason behind this is unknown. A number of 2015s are installed on the footpaths that are set away from the main roads in Derby's Pride Park area. A 'Heritage' variant of the 2015, examples of the Chantry can be found in the small precinct area known as 'Lock-Up Yard', just off the Cornmarket in Derby City Centre. Not a particularly common lantern in Derbyshire, the Pathfinder lantern appeared in very small numbers in Derby and in slightly higher numbers in the wider County of Derbyshire. 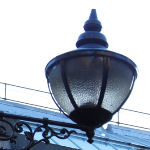 Being primarily designed for use on footpaths and narrow roads, the lantern never made an appearance as a general street light. The first Stela lanterns in Derbyshire appeared in the village of Hayfield in 2010, as part of the refurbishment of the Memorial Square area. 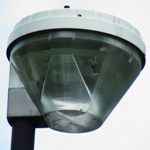 Since then, many varieties of this distinctive LED lantern have appeared around the County. Following the application of the Stela Square in Derbyshire, the larger 'Wide' variant appeared soon afterwards; its use being required in scenarios where the output of the Square did not provide sufficient brightness for the light levels required.